Description: Approximately 3/4 mile of the Lake Fork of the Arkansas River, plus another 3/4 mile on Rock and Willow Creeks. This tailwater of Turquoise Lake averages 25 feet in width and offers one of the most spectacular vistas of all our tracts. Good population of Browns to 18 inches and a few cutthroats over 18 inches. Rock and Willow Creeks are much smaller and offer heavy willow cover and some beaver pond-type water. 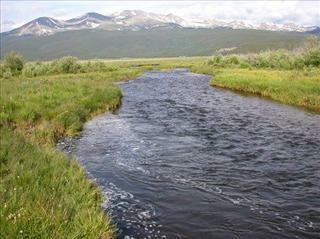 Location: This property is located 4 miles SW of Leadville, less than two hours from Denver.